Rangpur Division is a region in Bangladesh. During the Pakistan period Rangpur division was then as a district of East Pakistan. 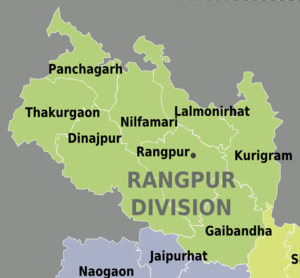 The Rangpur Division was split from the Rajshahi Division on 25 January 2010, become the seventh division of Bangladesh. Bengali is spoken widely, but the local dialect Rangpuri is also common throughout the populace. English is spoken by many in the larger towns and cities. There are many palaces and British-era buildings in the Division's capital. Vinno Jogot, Rajbari, Rangpur Zoo, Shirin Park are the most common places to travel. Apart from these Rokeya University, Charmichael College, Ghaghot River, Tista Barrage are also places to see and hangout. This page was last edited on 15 May 2018, at 13:10.